Like many great businesses, PageGroup started from a formidable mix of vision and determination. Since beginning as a two-man operation in the UK back in 1976, we have secured our position as global leaders in recruitment, with 140 offices over a network of 36 countries. Today, our founding mission remains unchanged: to bring the world’s best employers and brightest professionals together. What makes Michael Page Australia’s leading recruitment agency? Our leadership team has an average of over 12 years with Michael Page, and we employ specialist consultants who are experts in their industries, so they understand the skills and experience you’re looking for. What’s more, we’re committed to delivering useful content digitally to our clients to ensure you stay up to date with the latest developments in your industry. Whether you’re a candidate or a client, our relationship doesn’t end when a job opening has been filled. We stay in touch to ensure employers and employees alike are set up for long-term success. Over 90% of our current business comes from personal referrals and repeat clients, which goes to show we’re committed to building long-standing partnerships and providing quality service. Our recruitment specialists are always on hand to offer expert insights into updates and trends within your sector. Here at Michael Page, we specialise in mid- to senior-level level professional and management recruitment for permanent, temporary, and contract roles. 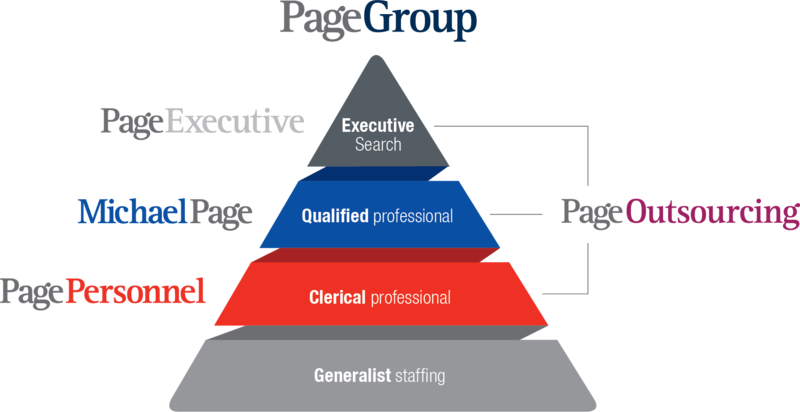 The Page Executive team provides search, selection, and management solutions for leaders at upper management and executive levels. Page Personnel’s consultants provide recruitment expertise for permanent, temporary, and contract administrative support and junior management roles. Tailored solutions for resourcing project management and managed service. To discuss your hiring requirements, get in touch with our recruitment specialists, or submit your CV to be considered for exciting new job opportunities.